How should we add calcium chloride to a swimming pool? How can we make sure we're handling it safely, and properly, to avoid unintended consequences? 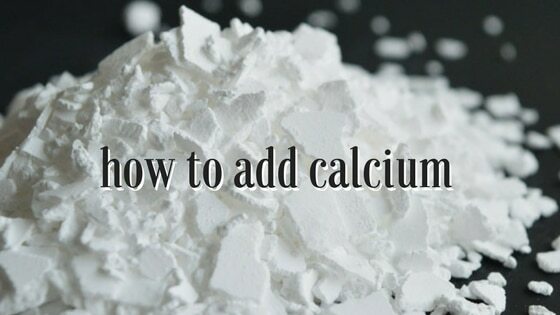 Adding calcium is not as simple as it sounds...you don't just throw it in the pool. Calcium chloride doesn't dissolve the same way as dry acid, sodium bicarb or a non-chlorine shock; calcium chloride gives off a lot of heat. Like any other dry chemical, however, calcium chloride should be pre-dissolved in a bucket prior to adding to the pool. Let's explain. Until recently, calcium hardness and its importance water chemistry has been underestimated. Good calcium hardness levels can make managing pool chemistry so much easier and cost effective. Calcium provides stability. It is remarkably consistent when left alone, and when coupled with good LSI management, calcium hardness helps water chemistry behave in a more predictable way. We suggest testing for calcium out of the tap, during initial fill ups, and once a month or so after that. Regardless of where you live, water gets colder in the winter time. In much of the country, pools freeze...and even in warm places like Southern California, Arizona and Florida, water temperatures can dip below 50 degrees for several weeks at a time. Water temperature getting colder seriously affects the balance and makes for more corrosive pool water. Calcium-deficient pool water gets aggressive and will steal calcium from anywhere it can find it. If a source isn't readily available, the water will corrode through all sorts of equipment (like heaters and salt cells) looking for calcium. We have determined (in our opinion) that calcium hardness is the most misunderstood chemistry in the pool business. But the truth is, calcium is a very consistent chemistry in pools; it doesn't fluctuate like pH or alkalinity will. It's a sturdy foundation to balance water around. The Orenda LSI app taught us calcium's importance, and why its stability is such a benefit in water chemistry. How much calcium hardness is ideal? At Orenda, we hear this question all the time. Here's our answer to everyone: the ideal calcium hardness level is one that allows you to comfortably maintain LSI balance year-round. The colder your climate, the more calcium hardness you should have in the water. We differ from many textbooks on this, and we do so based on our own learning of the LSI and in-the-field evidence. We suggest 300 ppm calcium hardness as a minimum, even if you're in a hot climate. If you are in a climate where your pool can freeze, 400 ppm is the bare minimum for you...though it's even better if you have 450-500 ppm. As a matter of fact, many commercial pools that use calcium hypochlorite (cal hypo) chlorine routinely maintain calcium levels over 700 ppm without scale problems. Scale is not a function of calcium hardness alone, but of calcium carbonate (CaCO3) saturation, as measured on the LSI. Too much calcium can be a bad thing, and cause scale. Scale is annoying, but guess what? It doesn't damage the pool. Scale is treatable; the opposite problem of being under-saturated with calcium (which causes corrosion and etching) is not. Add calcium to get the water happily saturated with it, and etching/corrosion problems can be prevented. Add calcium in four easy steps. Calcium chloride - The Orenda App displays 77-80% flake, but you can also use prill/granular. A dry measuring cup or bucket - dose properly. Don't cut corners. Test your pool water and your fill water for calcium hardness. Record results. The Orenda app will tell you exactly how much calcium chloride you need. Bring the calcium and the items above to the pool, and put on safety glasses and gloves. Dip the bucket into the pool until it is about 3/4ths full of water. Slowly pour the measured amount of calcium chloride into the bucket. If your dose is more than the bucket can handle, you will need to repeat these steps, or use multiple buckets. We strongly advise you to use good judgement in how much calcium a bucket can hold. Do not exceed 10 pounds per bucket, as it will be difficult to dissolve and can get too hot for the bucket. We have seen plastic melt! Be very careful with the heat. Safety glasses and gloves are important to avoid accidental burns. It may help to put the bucket in the water to help cool it down. Stir until the calcium chloride is completely dissolved. 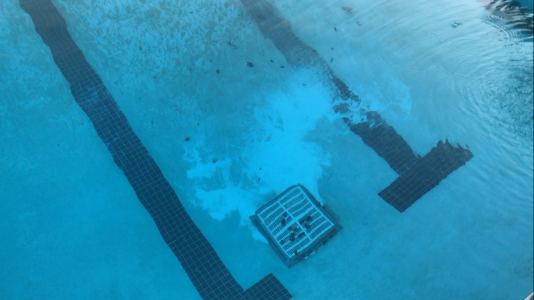 Pouring undissolved calcium in the pool can get to the bottom and burn the pool surface, leaving a mark. Slowly pour the completely dissolved calcium chloride into the pool. Maybe do about half the bucket, then let fresh pool water into the bucket, and stir again, and slowly pour again. It helps regulate the hot temperature of the water, and it also gives you more time to make sure everything is dissolved. Add calcium the right way, and it will go well for you. Don't just throw calcium chloride in your pool. It takes time to dissolve. Never pour calcium directly into a skimmer or gutter. That is a really bad idea and can wreak havoc on your pool equipment and filter. Calcium is an alkali earth metal and it's harder to dissolve than some other pool chemicals. If you add calcium the proper way, you shouldn't have problems. What not to do: never throw undissolved calcium in your water! It will sink to the bottom and it gets very hot. It can burn and damage your pool surface. Always pre-dissolve calcium in a bucket before pouring it into your water.